They have produced almost all of the types of sewing machines. 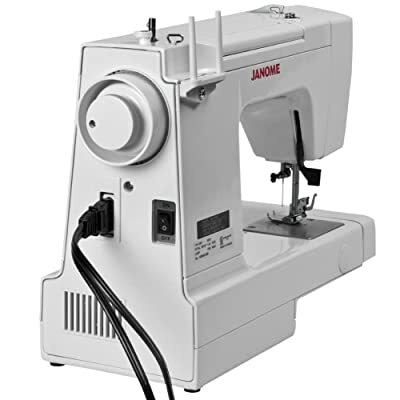 Amidst them Janome HD1000 Heavy-Duty Sewing Machine with 14 Built-In Stitches sewing machine is a very well-known heavy duty machine. We are going to review this machine in this article. This machine is unquestionably the perfect machine for the beginners and as well as everyday use. It will never cease to satisfy you with its performance. In sum, we can state that this sewing machine is quite a performer. This sewing machine comes with so many attractive and productive features. Although it is a budget friendly sewing machine, it is loaded with a lot of features. We are going to uncover them. It has 14 different built in stitches. It comes with a free arm with the help of that you can sew large dresses easily. It has a 4 step buttonhole system. It’s body frame is built up by cast Aluminum so that it can give an incredible performance on heavy cloth sewing. It comes with auto needle threader. Has thread tension dial and stitch selector dial. Has an LED light for sewing on dark. This machine is an incredible machine for a low price. You will not get this type features in a similar kind of lower priced sewing machines. It is the perfect fit for the day to day use. So, if you use a machine regularly for sewing and want a reliable one for your precious work. Then it can be the best choice for your criteria. Again, if you are a beginner who don’t know so broadly about sewing then Janome HD1000 will be the undisputable choice for you. Because, this machine is intended and designed for the beginners. But, if you are a professional or might be you sew heavy clothes every now and then. In this point, Janome HD1000 comes with its conveniences. As this machine is built with cast Aluminum which is so rigid. That’s why, you can use it for that type of sewing too. So, at last we have to conclude by saying that it has many benefits and you can use it whether you are a professional or a novice at sewing. Connect one end of your power cord to the power jack of your machine. Plug in the other end to the wall socket. Locate the power button and turn ON the sewing machine by switching the button to ‘ON’. Set up the spool pin. Then take your thread and place it on the thread holder/spool pin. Take the bobbin which came with your sewing machine. Place your bobbin on the bobbin winder. Pull some thread from the thread holder/spool pin, wrap it around the thread winder. Place the end of the thread inside one of the bobbin holes and pull it to extend the thread to hold on to the thread. Turn on your sewing machine and press on the foot pedal, and your bobbin should be started winding. When the bobbin is full, stop your machine and cut the thread. Then start threading the needle by automatic needle threading system, follow the illustration of the machine’s body and you will be done with needle threading. If you want, you can adjust the thread tension with the tension control dial. The maintenance process of this sewing machine is alike to other sewing machines out there. After using, always turn it off and disconnect the plug from the wall socket. Whenever you are going to make any adjustment/ on your machine, turn off the sewing machine. If your needle has broken, then change it, never use any broken or bent needles. Clean the hook area per week, if possible 3 days in a week. While you are not using the sewing machine, protect it with the soft cover. Be aware not to put any object into any openings of the sewing machine. Always use sewing machine oil to keep your machine away from harms. All the time, wipe and cleanse the sewing machine after using. By taking apart the bobbin case, with a lint brush, try to clean the feed dog area. Do not spray aerosol near your sewing machine. Always use the perfect wall socket that has the perfect voltage amount. Do not block any air openings of sewing machine. The Janome HD1000 Heavy-Duty Sewing Machine is a fantastic user friendly sewing machine. Needless to say it is a budget friendly sewing machine too. With its high quality metal finished body, it can give you an adequate experience of sewing. So, either you are a novice or pro on sewing, it could be an impeccable and advantageous choice for you.